Microsoft on Monday made its latest bid to stem share loses in the mobile sector with a new version of its Windows Mobile software that includes an online store for third-party applications and also ties into a new cloud service for syncing mobile data. Presenting at the Mobile World Congress 2009 in Barcelona, the Redmond-based software giant said it's signed deals with a number of top-tier mobile partners to deliver the next generation of Windows phones that will run Windows Mobile 6.5, which features a new user interface and a richer browsing experience when it becomes available during the second half of the year. The same phones will also debut two new services similar to those offered by rival Apple to users of its iPhone handsets: My Phone, to sync text messages, photos, video, contacts—but not email —to the Web; and Windows Marketplace for Mobile, a new online application shop that will provide direct-to-phone mobile applications and can be accessed from both the phone and the Web. One of the highlights of the new Windows Mobile software is a touch-screen interface with a honeycomb Start screen "designed for use with your fingers to accurately select the application, folder, game or setting quickly and easily." Users who password protect their handsets will also see a new Lock screen that will allow responses to interactive user interface elements  such as those for missed calls, voice mail, e-mail, text and calendar items  with a simple PIN without unlocking the entire device. 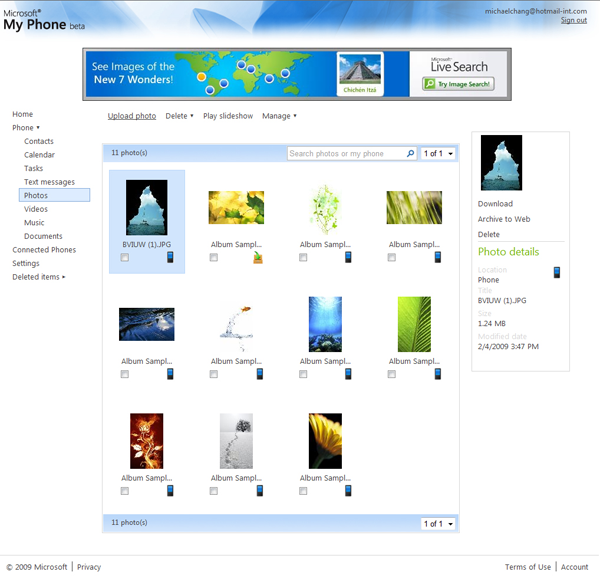 Windows Mobile 6.5: Lock screen (left), Start screen (center), Internet Explorer mobile (right). Windows Mobile 6.5 phones will also ship with a new Internet Explorer Mobile browser that promises "desktop-quality rendering" similar to that provided by Apple's version of mobile Safari. The browser will also let users search in the address bar of the browser like the iPhone and support Adobe Flash Lite, which the Apple handset does not. Microsoft formally announced its answer to portions of Apple's MobileMe service with a complimentary mobile data sync service conveniently called My Phone. The My Phone service will let users view and manage photos on their phone from the Web.. While both services offer to sync settings, contacts, and calendar data, as well as present a web interface for accessing and editing the same data, My Phone also serves as an online version of some of the features of iTunes, allowing it to backup the entire phone device to the cloud and then restore that image to a new phone. The service, which is currently available in a limited invitation-only beta, also offers to sync photos and video taken by Windows Mobile phones to its online service, similar to how the iPhone can upload photos to a MobileMe gallery. For more on My Phone and how it compares to MobileMe on the iPhone, please see the AppleInsider report titled, Microsoft plays catch up to MobileMe with My Phone. Perhaps the most significant of Microsoft's announcements are plans to take on Apple's App Store with a similar service dubbed Windows Marketplace for searching, browsing and purchasing mobile applications from Windows phones or from a PC by using a Windows Live ID. The new marketplace will be included with all Windows phones based on Windows Mobile 6.5 and allow developers to offer applications to customers through a security and compatibility check facilitated by Microsoft. As part of its announcements Monday, Microsoft said it has inked a new deal with LG, the world's third-leading handset vendor, to install Windows Mobile on the majority of its phones. 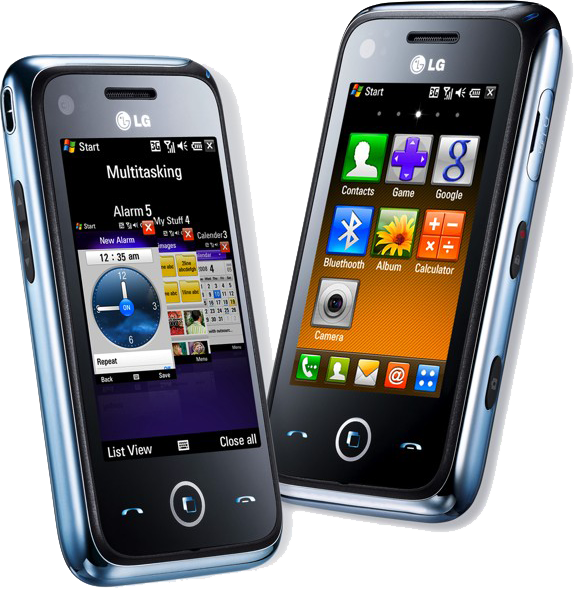 The LG-GM730—making its debut with a custom version of Windows Mobile 6.1 —will reportedly be the first smartphone to use new version of Windows Mobile OS integrated with LG's advanced 3D S-Class User Interface. "The combination of Windows Mobile and our new 3D S-Class User Interface will make the LG-GM730 the most functional and easiest to use smartphone ever created," said Dr. Skott Ahn, President and CEO of LG Mobile Communications Company. "This phone is a springboard for us. We will launch a number of smartphones this year; most of them will follow this same winning formula." The LG-GM730 will make its debut in the coming months but is unlikely to be sold in North America. LG's S-Class UI skin sports a 3D cube layout, four customizable home screens, simplified email setup, and "flick of a finger" navigation, while the LG-GM730 itself supports 7.2Mbps HSDPA, 2Mbps HSUPA, and Quadband EDGE. Additional specifications will be announced before the phone goes on sale in the first half of 2009. 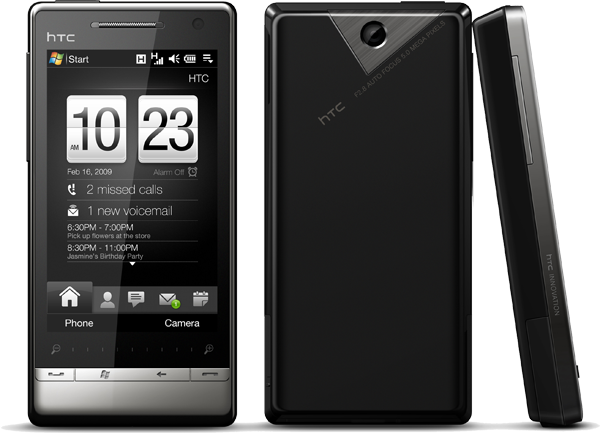 Similarly, HTCs Touch Diamond 2 and Touch Pro 2, also announced Monday, will be upgradeable to Windows Mobile 6.5. 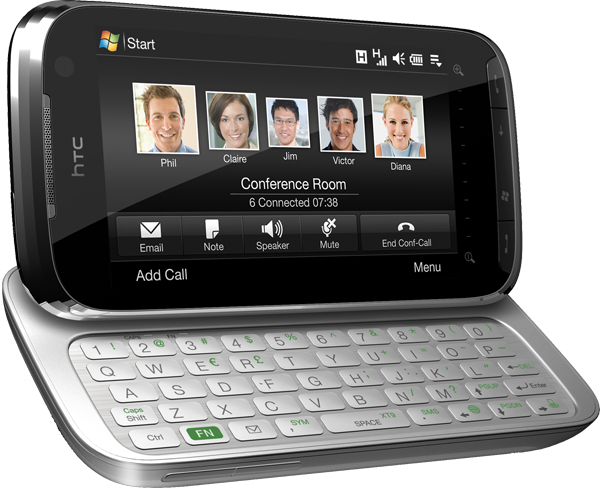 Currently based on a customized version of Windows Mobile 6.1, the Touch Diamond 2 features TouchFLO 3D, a slim design with a large 3.2-inch high-resolution wide-screen display, while HTC Touch Pro 2 introduces new Straight Talk technology, an integrated e-mail, voice and speakerphone experience.